The second generation CR-V looked barely any different to the first model, but was actually much more sophisticated and the first CR-V to have a diesel engine. 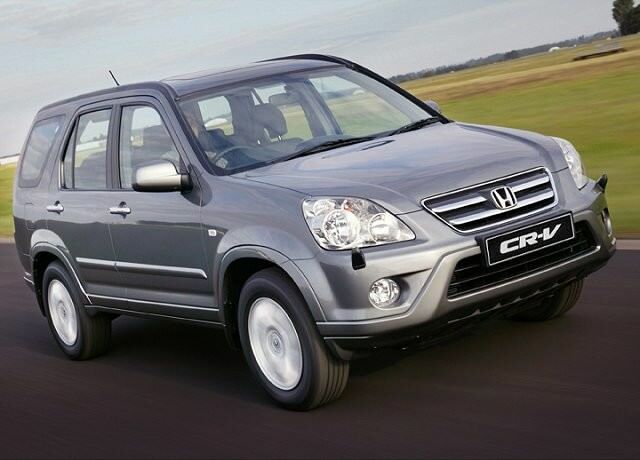 It may come as something of a surprise that Honda’s short-lived second generation CR-V (which was only in production from 2002 to 2006) was actually an entirely new model. I say surprising because at a casual glance it looked barely any different to the 1997 Mk1 CR-V – more like a facelift than a new car. It was actually entirely new from the wheels up though, being based on the Mk7 Civic. It kept the side-hinged tailgate, with the spare wheel mounted on it, but the suspension (McPherson strut front and double-wishbone rear) was rather more sophisticated than most rivals’. If you’re buying a CR-V to go pounding across rocks, mud and sand you might be buying the wrong car. Although four-wheel drive was standard, it’s only a part time system, with power going mostly to the front wheels, and it’s really not designed for the rigours of off-roading. A damp field is about the limit of its abilities. Don’t worry though; the CR-V’s strengths lie in other areas. It’s staggeringly reliable for a start. The only recurring fault is with the exhaust gas recirculation valve (part of the emissions equipment), which can go wrong and cause the engine to lose power or even cut out entirely. If the CR-V you’re looking at hasn’t had its EGR valve replaced recently, get it done. Other than that, it should be plain sailing on the reliability front. The CR-V is a spacious, useful family car, so check the interior for signs of abuse at the hands of an army of kids and if you’re looking for a diesel then you’re going to have a limited choice – the 2.2 i-CDTi engine was only introduced in 2005 so they’re thin on the ground. Again, don’t worry – the 2.0-litre petrol is vastly more refined than the diesel and it should still easily crack the 30mpg barrier in daily driving. And it’ll be a little cheaper to tax too. You can pick up a Mk2 CR-V for as little as €3,000 if you shop around, and they’re well-equipped too – the basic SE versions came with air conditioning, electric windows and lots of airbags (which helped it to a solid four-star EuroNCAP result). As a cheap entry point to family SUV motoring, it’s pretty hard to beat really. Spend around €4,000 for a 2005 2.0i VTEC SE. It may be long in the tooth at this stage, and its Mk3 successor is by far the superior car, but the second-gen CR-V is an unquestioned bargain, reliable as the day is long and spacious and practical enough to be a beloved family hauler. With prices now very low, it’s a perfect first rung on the SUV ladder.